…but we haven’t won anything yet. 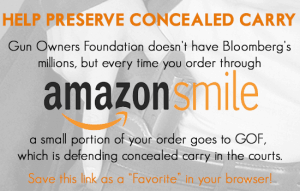 We still don’t have nationwide concealed carry reciprocity. And Obama’s anti-gun Executive Orders are still in force. 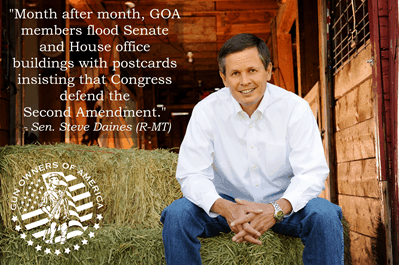 I’m Steve Daines, United States Senator for Montana. And I am absolutely committed to making sure we rip out the heart of Barack Obama’s eight-year war on the Second Amendment. Republicans may have the White House, the Senate and the House, but unless something is actually done to roll back Obama’s anti-gun mandates, it’ll be like Hillary won. That’s why I am personally asking you to join Gun Owners of America for one year for only $20. I can tell you two things about GOA’s effectiveness. 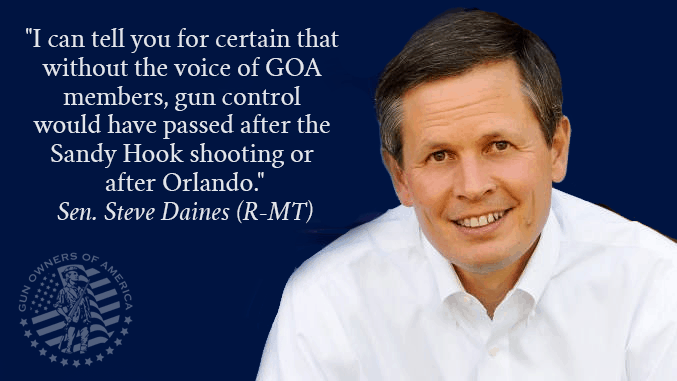 And secondly, I can tell you for certain that without the voice of GOA members, gun control would have passed after the Sandy Hook shooting…or after Orlando…or after any tragic event which the media and anti-gun politicians use as an excuse to take away YOUR gun rights. Now that Donald Trump is about to take office, this is the time for you and GOA to tell my Senate colleagues that you expect them to actually do something, like passing REAL national concealed carry reciprocity. Not only that, we have to make sure that Obama’s anti-gun Executive Orders are repealed and that we get OUT of the UN gun treaty. We can’t let that happen again, especially since Donald Trump will be sworn in with two FEWER Republican senators than Bush had. We MUST get out of the UN’s “Arms Trade Treaty,” which requires committed countries to compile tracking lists of every gun and gun owner. We MUST repeal Obama’s anti-gun Executive Orders. As long as they are in force, it’ll be like Obama, not Trump, is the acting President. The Republican Senate won’t do that unless they hear from you! Most congressional bills that claim to be national reciprocity don’t apply to the one in five gun owners who live in the 12 states that actually practice Constitutional Carry. That’s why we need to pass GOA-backed legislation like a concealed carry reciprocity bill that stops anti-gun states like New York and California from cancelling the Second Amendment rights of Americans from other states. We’ve been here before, with a Republican president, Senate and House. Don’t let them make that mistake again! P.S. I was so happy to see Donald Trump win and Hillary Clinton lose. But gun owners haven’t won anything yet. Obama’s gun bans are still in force, the U.S. is still signed on to the UN’s latest gun grab treaty and we still don’t have nationwide concealed carry reciprocity. The last time we had a Republican President, Senate and House, not much got done. The 1994 Clinton gun ban was allowed to expire, but they never passed national concealed carry reciprocity. WE CAN’T LET THEM FAIL TO DO THAT AGAIN! That’s why I am personally asking you to join Gun Owners of America with a $20 one year membership. Each month, you will receive an information-packed mailing that includes a pre-written message for you to send back to Congress. This is your chance to tell my Senate colleagues that you expect them to actually do something, like passing REAL national concealed carry reciprocity — and making sure that Obama’s anti-gun Executive Orders are repealed and that we get OUT of the UN gun treaty.